Exoray, I think we misunderstood each other....when I referred to the claims that I went through on the RPF those were the UK claims that the judge addressed. You brought up the US case and I still was addressing what I posted on RPF about the UK case. Maybe I just speak for myself but I'm sure there are assumptions we've had before that changed as a result of this judgement. That aside, I think it would be interesting to compare the views of the California judge versus those of the UK judge in terms of what was shared in common with the US and UK claims, but I'm still recovering from reading the current document. 1. AA lied to me about a lot of things and it's disappointing. 2. After all of this, his website is still up. What I would like to know from you Thomas, since you vehemently defended him, is this: What did he say that made a reasonably intelligent man like yourself, fall for his lines of BS, when others around could CLEARLY see he was lying? All of the photographic evidence of his wares made it clear, to even a trooper novice like myself, that he was full of it. Was it the fact that an assembler from AHN was open with you that clouded your vision? No offense intended, I am just curious. As to his website still being up, the guy needs to sell his other wares now. Especially since the judge stated that he did violate copyrights. It will only be a matter of time now. Lucas has deep deep pockets. Deep enough to bankrupt this guy in legal fees alone. One thing I gleaned from this page that Exoray posted is that Lucas does not give two craps about fans producing goods based on his characters as long as they are not making a profit from it. That is rather positive to me. Yes I defended him for a time, because what he told me was no different from what he had told everyone else. Even from what he told me I had suspicions, like the zoo animal story and how his inspiration for the face of the stormtrooper was based on insect faces. Did you hear that one? But if you had followed my arguments, they were based on what I saw in the details of the helmet, or in the technicalities of the case because I enjoy discussing the legalities from the point of view of how he could defend himself. For example, people said it wouldn't go to the UK and it did. People said LFL won because AA defaulted....yet that was the plan all along so it would go to the UK. People said he'd get fined $20 million and that won't happen, but we'll see how much. People said his website would be shut down and it's still up after all this time. Those are legal and practical issues and have nothing to do with defending AA's character. Did he have the original molds? If you say he's lying that's a character issue. If I say well the helmets have these details so maybe he does. I rather examine what things look like that what someone says. I have no technical background in vacuforming so if he gives this long-winded explanation on how he created the molds and how the molds were tools and how there was no sculpture (false as we found out this year but I knew that for a long time...but never saw what it looked like) and that he modified the armor for production (I found out that was false long before he even showed his recast armor), and I see these photos taken at the time of the original helmets and armor he made, and no one seemed to know who sculpted the helmet, nor where the original molds were...not even LFL knew at the time otherwise it would have been stated in the US claims, then who should I believe? A bunch of guys on the RPF that don't like the competition, or the original maker of the stormtrooper helmets and armor for Star Wars? If the rear cap doesn't have a swoop that proves he's lying about everything? Come on. It's easy to say now whatever you want to say. And it's easy to point a finger at me and say I defended him. From day one, the attack against him was about the molds. He doesn't have the original molds people would say because the helmets don't look right. I tried to show what looked right to me and I didn't like the way the RPF members were automatically questioning his integrity, it became a personal attack on him, and as it became more and more public as he posted statements of his contribution to defend himself, that fed the fire for legal action against him. Well we still don't know what the original molds looked like and if he has them, do we. So that argument is not settled, is it. I didn't say he has them, I said WE DON'T KNOW FOR SURE IF HE DOESN'T. There's a difference. Did you know that AA made numerous efforts to work with LFL early on, but they ignored him? This was long before the complaint. LFL doesn't care about the lesser known people who contributed to the production, they only care about the bottom dollar and who they determine gets a license to produce replicas. Give them 2 millions dollars and you can make whatever inaccurate prop replicas you want. We've seen this before. Is that good for the hobby? We had a chance to get helmets made by the same person who made the originals and we spit in his face. Sure he deserved it for taking more credit than he should have, but do you think after all this that any crew member will ever come forward to do something for the hobby ever again? People don't look at the big picture. Just think about how much excitement there was initially when people found out he would make helmets. Then those whom he snubbed in terms of business prospects became the proponents of the personal attacks on his character. All they wanted was access to the original molds and a piece of the pie. They didn't get it. Once I found out that AA didn't do the armor, naturally that threw into question his character. But I didn't argue the armor, did I. I argued about the stormtrooper helmet based on what I saw as it coming from something authentic. The question was did he have the original molds? I took the stance maybe he did and that was my choice, my perogative. If he didn't have the molds, then where did he get the helmets from? All from prototypes? His main argument was that the molds were the sculpture, so I went on that. But when did we see the photo of the Pemberton sculpture? Just this year. You can call him what you like, and he's stupid for lying about his contribution, and I am as disappointed as anyone else that he lied to me, but I was arguing the case based on what I knew at the time. You can think whatever you like about that now. But I would defend anyone else on the RPF or off that I think was being unfairly accused meaning without evidence of wrongdoing. That is the hallmark of our justice system, but the RPF became an inquisition and that was disappointing to see in this hobby because it was profit-driven. So, it doesn't matter who will come along in the future to offer props made like the originals, if they compete with established fan-made replica prop makers, the same thing will happen again. That's what I was defending. The hobby. Think about those who encouraged AA into the business. They act so innocently, only to bear witness against AA while doing the same thing he's doing. There's nothing left to defend in the hobby as far as I am concerned. Last edited by SithLord on Mon Aug 04, 2008 3:42 am, edited 1 time in total. Thomas, I have to say you were one of his staunchest defenders. You can call it fingerpointing, which attempts to disguise the fact, all you like, but it is the truth, from your own fingers. For me, all of the pictures you posted only fortified MY OPINIONS that the guy was lying and that his helmets had more in difference than they did in common with the original helmets. As far as he approaches to LFL, you are basing that on more than his word, I hope. He has already shown to be a liar of EPIC proportions. This should also cast a light on his words regarding those people "who only wanted access to the original molds". As someone said somewhere, if this guy said the sky was blue, I would have to go out and see for myself. Even then, I would have to take comparison shots with other blues. The guy is one of the more dishonest businessmen that I have heard about. Let's look at a few things in regards to his claim of original molds. First, the missing details you liked to highlight in your numerous defense posts. Awkward nuances missing from his pieces that were in the originals. Then let's look at how similar helmets we know are not from original molds look compared to his "original mold" helmets. I am sure you have the pictures and can now look at them with an objective eye now that you know he was lying. His work pretty much speaks to the fact that he does not have them. I think it is safe to let this one go now, Thomas. As far as your defense of him went, it did make for many interesting arguments. I kept rolling my eyes, trying to figure out why you did the things. It is good some folks DO still look at things thinking that some people can be honest. As far as the crusader-esque comment about defending original prop makers, I honestly think they can defend themselves and their work will speak louder than any words you can type/utter/scream/write. For you to defend the hobby, and I am trying hard as hell to not doubt you on this, you would have had to step back and be objective. Throughout the whole affair, that is one thing you were not. The only thing you were defending was Andrew Ainsworth. You were defending a man who's sole purpose was not to the hobby, but to his pockets. Look how much more he was charging for his wares than comparable items from "fan made" crafters. Ludicrous...that is all I can say. When you say, "We had a chance to get helmets made by the same person who made the originals and we spit in his face." does that mean it's our fault now that he got sued, and that the fandom has ruined things for the fandom such that "no crew member will ever come forward to do something for the hobby ever again"? We spat in his face? Like he didn't spit in our faces with his sales propaganda? Like he didn't spit in Brian Muir's face when he claimed he came up with the body suit? Should we have rolled over and accepted and believed everything AA had purported? It's almost coming across as if you're blaming fans for Ainsworth getting sued and having lost. Regardless of the hypocrisy of fans and business relationships that didn't work out that you're alluding to, nobody told Ainsworth to lie. Even if you happened to be in the know that AA had made numerous efforts (we've not seen the evidence ourselves) to speak with LFL, you don't have the full story. Regardless, it does not justify exaggerated authorship/ownership claims. In retrospect, nothing Ainsworth says can be reliable, if that's your inside source. Well as an SDS owner I am bummed, but again not because I was duped by claims of original molds. As I've said before, I personally found the appeal of AA's merch to be attractive due to its style/look, its out-of-the-box wearability, and its affiliation with the company's lineage. Having purchased the battle spec and the armor, I knew going into the purchase that neither were from original molds (made clear on the site), so that just wasn't a factor for me. What is a factor is the fact that he appears to have been less than completely truthful, shall we say, about his involvement with the designs in the first place, esp the armor. After reading the judge's synopsis of his believability, based on this and other cases, it underscores the bad taste in the mouth. One can look at many of the statements he put forth and find some truths in it, to be sure, but looking at the whole picture is fairly damning. Think OJ Simpson. To be fair I would like to add that beyond the intellectual rights issues, I have to commend SDS on the manufacture and assembly of the product (I have no issues with the quality of the armor as I've heard some others report). It was assembled flawlessly, the craftsmanship is excellent, the packaging was excellent and the communication with Andrew was impeccable. Truthfully I wish I had as good of service with every company I ever did business with. 84.The film was duly made, and its success is a matter of film history. It spawned sequels and "prequels". Marketing opportunities were thoroughly exploited by Lucas, yielding many billions of dollars. Mr Mollo had asked Mr Ainsworth to return the McQuarrie drawings that he had been given, and Mr Ainsworth did so. He was not asked to return such other drawings as he was given. He was also not asked to return any other material, including the tools that he had made. In 1997 he found them and wrote to Lucas suggesting they might be exploited, but nothing came of that. He still kept them. He sold some items he had kept at a Christie's auction in 2000. Nothing turns on all that. Which begs the question: Why would he approach LFL to produce TK wares if he had nothing substantial to offer them (i.e. original moulds)? I'm curious as to how the specific cost of a Star Wars license was arrived at, such that it was supposedly cost-prohibitive for Ainsworth to approach LFL legitimately. $2 million? Consider Altmanns. Personally, I don't see them making $2 million to even break even. However, I noticed that their license is geographically restricted, which suggests that different geography-based licenses have different pricepoints. If money were the issue, Ainsworth could have simply gone for a license that was restricted to a UK market reach. Is LFL against things that come from "the original molds"? No. Consider the Rubie's Deluxe Vader. The box says "Cast from the original molds." Is the Ainsworth mold 100% accurate? Absolutely not; it's warped and inaccurate. So if LFL allegedly doesn't allow fully accurate stuff being made by licensees, well, hey, the Ainsworth molds completely meet the inaccuracy requirement. So, in my opinion, price and accuracy were never barriers to Ainsworth pursuing something legitimate with LFL. Does it matter whether AA tried to get a license or not? LFL can give a license to whoever they want and at the price people are willing to pay and they apparently didn't want AA to have one. Regardless, he went ahead and produced helmets without a license anyway and on top of that making claims and stealing credit... and he got slammed for it. Doesn't make anything right just because he allegedly "tried" to get permission from LFL beforehand. I'm not saying what he did was right. And my posts on the RPF speak for themselves. I've explained myself and it is up to any of you how you want to read into it. And don't tell me that the fanmade helmets are cheaper when Gino offers his for $1000 a pop and smugly justifies it. All you guys are interested in doing is shooting me down just like you shot Andrew down before any of his wrongdoings were made apparent. I'd rather side against people that like to find fault and that like to incriminate for no apparent reason (at least the way I saw it at the time). I am not even sure why I need to explain myself to you because I stand by every post I make and every post I make is for a reason, and not just for shooting off at the mouth without reading the legal documents as so many did at that time. If you guys want to get into this in detail then I am prepared to if you want to make this personal...so for what reason? If you want to drag this out into something big, I'm ready to defend anything and everything I stated before. If I said that, for example, Andrew's lawyers planned the default from the start in order to take it to the UK, you guys just said oh he's lost and he won't defend himself because there's nothing to defend or whatever. Well, there was a reason and I stated that, and it went to the UK and LFL had no choice but to fight it in the UK and could not levy penalties against AA based on the US ruling. So if I state it as such then I am defending Andrew? Ya, right. Give me a break. You can either make your assumptions and let's get into this, or drop it and read my posts before addressing me personally about what I said or didn't say before. Read zenwalker's post please. And what's there to know? LFL snuffed AA. So he went solo. The fanmade helmet makers didn't get a cut of the pie, so they snuffed him as well. If they had a cut of the pie, none of this would have happened, but that is my opinion. Does that make what AA did right? Of course not. If I mention this does that mean I support AA? The majority of fanmades do not reach the $800 or $1,000 mark. GINO is the exception, and if people are somehow convinced that his helmets are so many levels of accuracy superior to an accurate TE, then they deserve to part with that much money. Kudos to GINO for using his personal marketing prowess to leverage himself into such a price-prestige position. However, just do a Google search on the fanmades. They range from $150-425 depending on finish and embelishments. Some are recasts, some are not. The majority of vendors have not, in fact, received cease and desists. 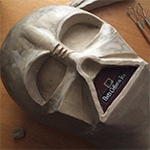 While there may be a few, I am only aware of two in general, outside of Ainsworth: stormtrooper-maker GF (who allegedly disregarded it, but we don't know both sides of the story) and Paul Harrison for, specifically, a recent auction of a Vader helmet and armor set. I do not know the facts as to why Paul Harrison received his C&D, but my best guess is that the name "Elstree" in "Elstree Props" would be presumed by unknowing fans as being connected with the original Elstree Studios. In this case, it would be misleading innocent fans. And if there is any desire on LFL Legal's part to stop misleading claims, that desire would be consistent with the LFL vs AA lawsuit. I see people villifying LFL for going after AA, claiming that LFL wants too much money. I don't mind speaking with their licensing person to get the actual numbers (usually that is proprietary information and not typically disclosed over e-mail or the phone) but I believe I've debunked cost as being a factor. LFL has repeatedly said through the media that they are NOT after fans, nor do they want to quench fan enthusiasm. Whether someone like GINO sells a few helmets and makes a certain dollar amount, or someone else sells a larger number of helmets at a lower price but nets an equivalent dollar amount, the issue more at focus in this lawsuit was the false claims. From my perspective, you're proactively shooting people down for AA getting himself into a mess of his own creating. He is responsible for his own actions, not fans who didn't buy into it. It is hardly the fans' fault that LFL sued AA. So my saying this can hardly be described as me trying to shoot you down, and, in fact, not only did I stay out of it when Qui-Gonzales brought up your AA stance in the TDF, I was also not a participant on the RPF when you expressed your strong observations regarding AA's accuracy. Conversely, I'm basically saying that you're wrong in painting everyone with a wide brush. Not all of us bought into AA's propaganda. While I need no validation from you, Thomas, you're failing to give credit to those people who happened to have a better eye for accuracy and/or propaganda. Few people agreed with me when I said the AA Stunt looked off (not that I have that great an eye for stormtroopers anyway). All they cared about was "lineage" and "provenance" and "original molds" to see the evidence staring them in the face. Add on top of that how charming AA can be, it must be quite elevating to have someone involved in the original 1977 production to speak to them. Some people visited him and were invited into his shop and given a personal tour. It must have felt like candy heaven. But if his product didn't look right, why not stop and ask why? Better yet, why not take what he says with some scrutiny? In retrospect, I'm curious to know what your reaction was when GINO posted on RPF why he believed Ainsworth's claims of accuracy and originality were false. It depends on who zenwalker's source is - with all due respect to zenwalker. Not everyone believe's TE because of his poor conduct with some of you, but I brought this up with him yesterday and I got a different story. I don't want to say that the truth depends on whether you trust AA more or TE more. Clearly there is a different side of the story to that "didn't get a cut of the pie" thing. In regard to your first reply I'll just say fair enough and that I don't actually disagree with most of the points. Sure TE has a different side and he presented that side here I think. But it wasn't just TE.